For other uses, see Ishaq (name). The biblical patriarch Isaac (Arabic: إسحاق‎ or إسحٰق[note A] Isḥāq) is recognized as a patriarch, prophet and messenger of God by all Muslims. In Islam, he is known as Isḥāq. As in Judaism and Christianity, Islam maintains that Isaac was the son of the patriarch and prophet Abraham from his wife Sarah. Muslims hold Isaac in deep veneration because they believe that both Isaac and his older half-brother Ishmael continued their father's spiritual legacy through their subsequent preaching of the message of God after the death of Abraham. Isaac is mentioned in fifteen passages of the Qur'an. Along with being mentioned several times in the Qur'an Isaac is held up as one of Islam's prophets. Because of God’s grace and covenant with Abraham Sarah was gifted with a child in her old age. Isaac was the age of 10 when his half-brother Ishmael went out from Abraham’s house into the desert. While in the desert Ishmael took a wife of the daughters of Moab named ‘Ayeshah. Abraham went out into the desert after three years to find his son Ishmael out of love for him and this is what started the separation between Jewish and Arab traditions. Isaac is mentioned fifteen times by name in the Qur'an, often with his father and his son, Yaʿqūb (Jacob). The Qur'an states that Abraham received "good tidings of Isaac, a prophet, of the righteous", and that God blessed them both (37: 112). "And We gave him glad tidings of Isaac, a prophet from among the righteous. And We blessed him and Isaac. And among their progeny are the virtuous and those who clearly wrong themselves" In a fuller description, when angels came to Ibrahim to tell him of the future punishment to be imposed on Sodom and Gomorrah, his wife, Sarah, "laughed, and We gave her good tidings of Isaac, and after Isaac of (a grandson) Jacob" (11: 71-74); and it is further explained that this event will take place despite Abraham and Sarah's old age. Several verses speak of Isaac as a "gift" to Abraham (6: 84; 19: 49-50), and 29: 26-27 adds that God made "prophethood and the Book to be among his offspring", which has been interpreted to refer to Abraham's two prophetic sons, his prophetic grandson Jacob, and his prophetic great-grandson Joseph. In the Qur'an, it later narrates that Abraham also praised God for giving him Ishmael and Isaac in his old age (XIV: 39-41). Elsewhere in the Qur'an, Isaac is mentioned in lists: Joseph follows the religion of his forefathers Abraham, Isaac and Jacob (12: 38) and speaks of God's favor to them (12: 6); Yaʿqūb's sons all testify their faith and promise to worship the God that their forefathers, "Abraham, Ishmael and Isaac", worshiped (2: 127); and the Qur'an commands Muslims to believe in the revelations that were given to "Abraham, Ishmael, Isaac, Jacob and the Patriarchs" (2: 136; III: 84). In the Qur'an's narrative of Abraham's near-sacrifice of his son (37: 102), the name of the son is not mentioned and debate has continued over the son's identity, though many feel that the identity is the least important element in a story which is given to show the courage that one develops through faith. 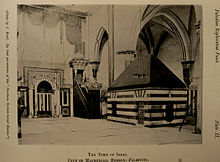 His tomb and that of his wife Rebekah is considered to be in the Cave of the Patriarchs in Hebron, known in Islam as the Ibrahim-i-Mosque ("Mosque of Abraham"). Alongside Isaac's cenotaph are the cenotaphs of some of the other Qur'anic/Biblical patriarchs and their wives: Abraham and Sarah and Jacob and Leah. ^A إسحٰق (ʾIsḥāq) is the traditional Quranic spelling after vocalizing with a super script ʾalif. In Modern Standard Arabic, it is normally written إسحاق (ʾIsḥāq); IPA: /ʔisħaːq/. Wikimedia Commons has media related to Ishaq. ^ Watt, W. Montgomery, “Isḥāḳ”, in: Encyclopaedia of Islam, Second Edition, Edited by: P. Bearman, Th. Bianquis, C.E. Bosworth, E. van Donzel, W.P. Heinrichs. ^ Bakhos, Carl (November 2007). Abraham Visits Ishmael: A Revisit. pp. 553–580. ^ Dagli, Caner; Dakake, Maria; Lumbard, Joseph, eds. (2015). The Study Qur'an (1st ed.). New York: Harper One. p. 1095. This page was last edited on 11 July 2018, at 14:30 (UTC).